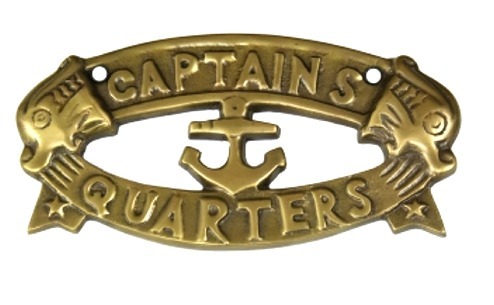 Solid brass "Captain's Quarters" nameplate on a solid mahogany base. 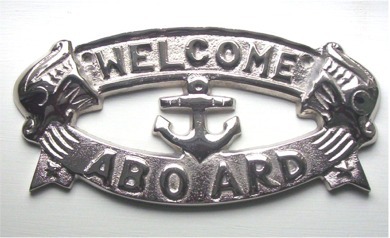 A must for the ship's captain either at home, aboard ship, yacht or at home. Size: 13-3/4" x 3" tall. Solid brass "Crew's Quarters" nameplate on solid mahogany base. A must for the door to the crew's quarters either at home or aboard ship or yacht. 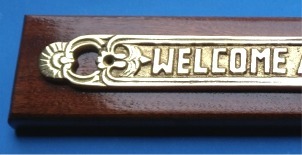 Solid brass "Welcome Aboard" nameplate on solid mahogany base. A must for every warm seaside home, boat or yacht. Size: 13" x 3" tall. 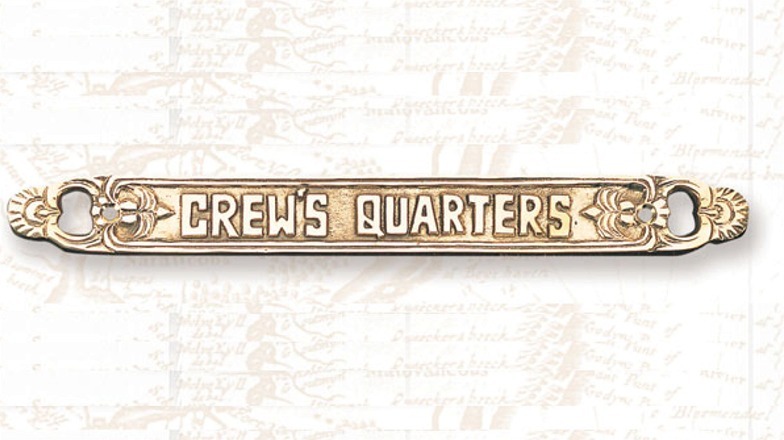 Solid brass "Captain's Quarters" nameplate. 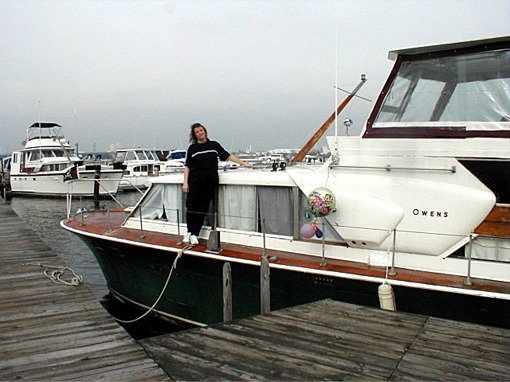 A must for the ship's captain either at home or aboard ship or yacht. Size: 13" x 1.5" tall. 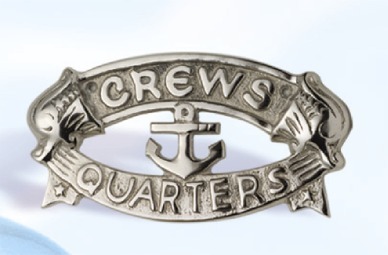 Solid brass "Crew's Quarters" nameplate. 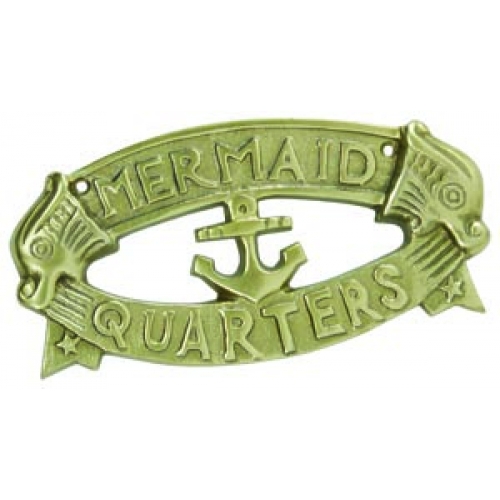 A must for the door to the crew's quarters either at home or aboard ship or yacht. Size: 12" x 1.5" tall. 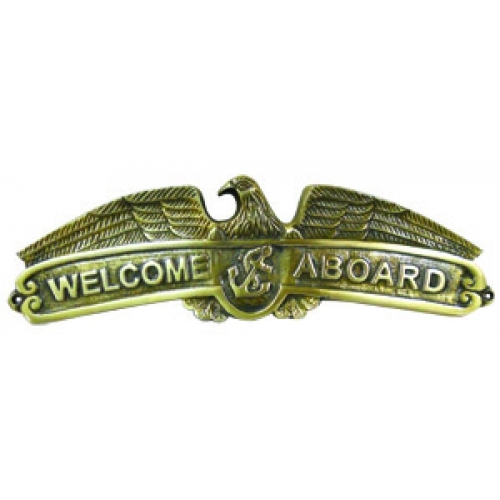 Solid brass "Welcome Aboard" nameplate. A must for every warm seaside home, boat or yacht. 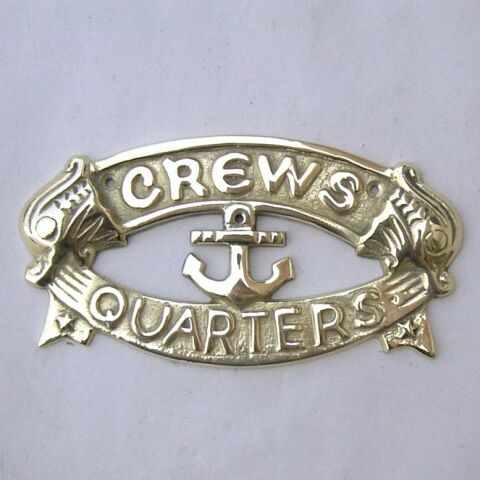 Antique Brass Plated aluminum "Captains Quarters" oval nameplate. Great sign for the Captain's room or wherever it is that he sleeps on or off ship. Size: 8"x4"
Nickel Plated solid aluminum "Welcome Aboard" name plate or door sign. Great sign for aboard your boat, yacht or at home. 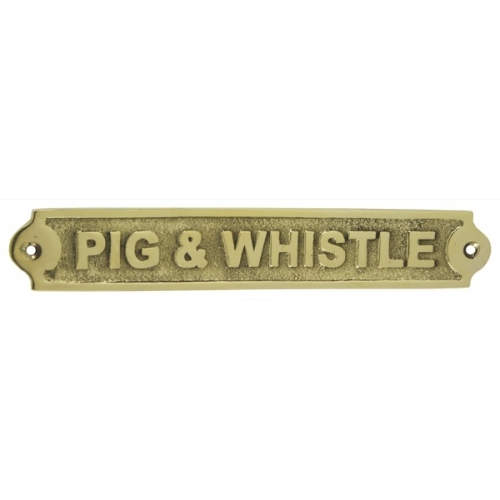 A very heavy solid brass name plate marking the essential "Rum Locker" on board or at home. A very heavy solid brass name plate. A great small gift for the bar or "Liquor Locker" at home or on-board. 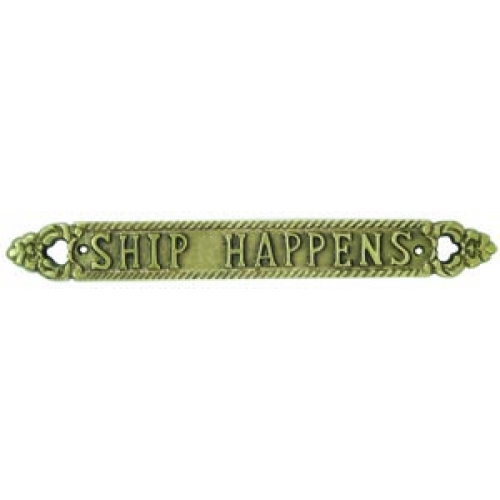 Measures 9-1/2"
Brass plated over aluminum "Ship Happens" name plate or door sign. This is true for every sailor. Cast Iron hand painted Americana "Captain's Quarters" Eagle door sign. 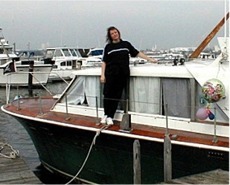 Just the thing for that staunch boat captain. 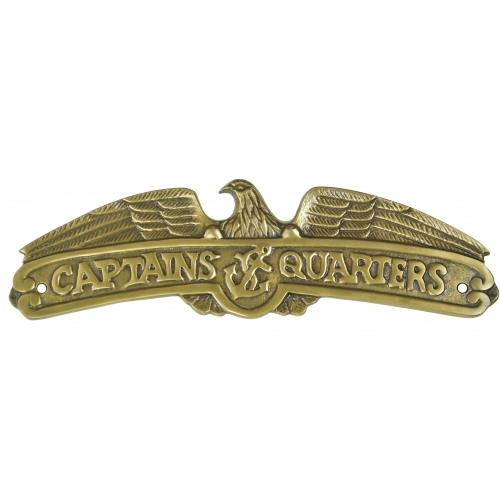 Eagle - Brass 18	 Brass plated aluminum eagle "Captain's Quarters" door sign. A great emblem for the career ship's captain. 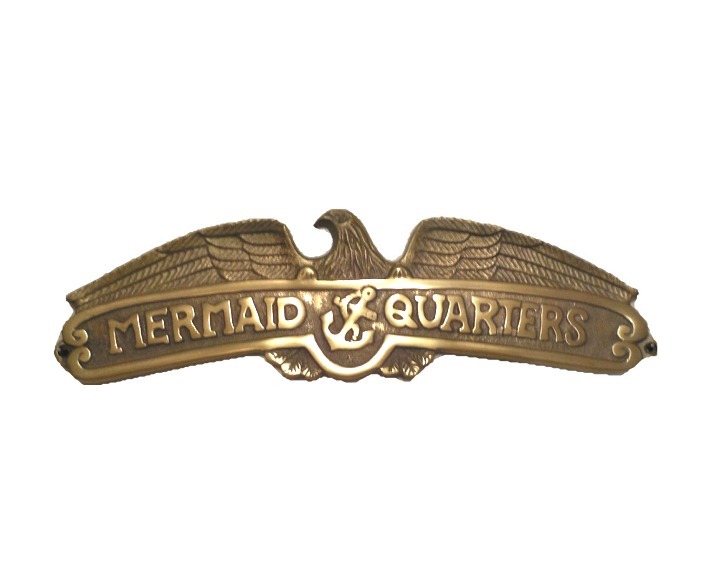 Eagle - Brass Brass plated aluminum eagle "Mermaid's Quarters" door sign. This sign really says "Keep out" gents. Eagle - Brass Brass plated aluminum eagle "Welcome Aboard" door sign. This sign really says "The bar is open gentlemen".